*Fees, Terms, conditions and credit criteria apply. Offer is available from participating Mercury Finance Dealers. 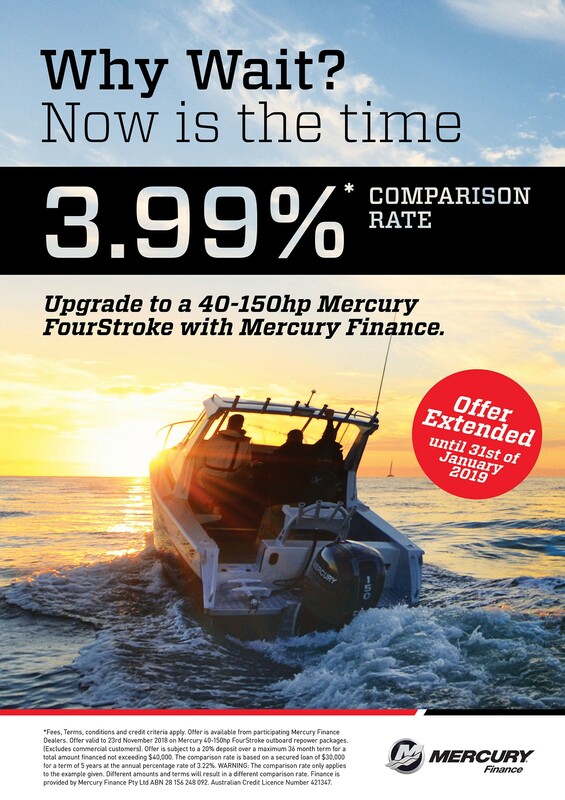 Offer valid to 31ST January 2019 on Mercury 40-150hp FourStroke outboard repower packages. (Excludes commercial customers). Offer is subject to a 20% deposit over a maximum 36-month term for a total amount financed not exceeding $40,000. The comparison rate is based on a secured loan of $30,000 for a term of 5 years at the annual percentage rate of 3.22%. WARNING: The comparison rate only applies to the example given. Different amounts and terms will result in a different comparison rate. Finance is provided by Mercury Finance Pty Ltd ABN 28 156 248 092. Australian Credit Licence Number 421347.